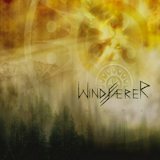 Retaining its Iberian influences and heavy use of the violin, Windfaerer returns with Alma ("Soul", in Spanish), but with a heavier guitar background and a brooding production. Listeners who enjoyed the folk-metal of the past two albums will continue to like this one, and it still has an emotional air to it, which is accentuated by the violin work, but it's got a more aggressive feel to it. Though Windfaerer songwriting has been very good in the past, the icing on the cake has always been the violin, and in Alma it is the most noticable instrument, even when the blasting guitars and the thundering drumming of new drummer James Applegate assault the ears. The violin is mixed smoothly on top of that foundation, the short, high-speed bowing very much like the tremolo picking of the guitars that match it. While Becoming is uplifting and major-key, its successors are darker and louder, overwhelming the listener with the guitars and violin at the front of the mix and the vocals pushed to the back. In fact, the vocals are practically an afterthought on this album. Never extremely memorable, Michael Goncalves' raspy shout has always been nonetheless servicable as an accompaniment to the far more melodic instrumental pieces, but the band keeps it playing second fiddle (no pun intended); the most it does is provide a gritty undertone to the sweetness of the violin. There are two short, strictly instrumental pieces, one of which is primarily violin-dominated and the other of which features keyboards. But the album is brought to a triumphant finish with the final full-length tracks, Journey and Under the Sign of Sol. Valcek outdoes himself on the violin as the rest of the band hammers with all their might. I liked how the violin veers from major to minor keys on Under the Sign of Sol too. In Alma, Windfaerer keeps its reputation as a solid act that delivers the goods without a huge amount of evolution; the biggest change here is the heavier and louder background to the violins. Fans of the folkier side of black metal will enjoy this one.